OpenBlade rack solution is designed for modular and scalable needs. 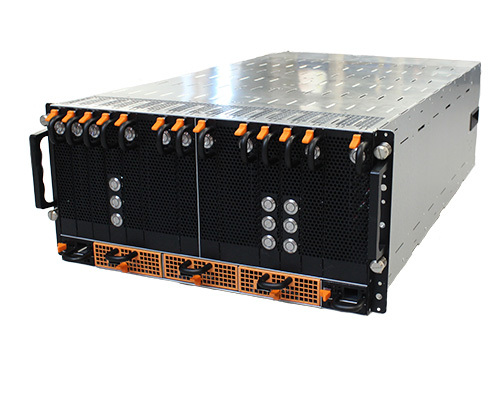 From 5U to 44U, the server enclosure cabinet includes network, management in a rackable chassis. The first hardware-agnostic blade server, OpenBlade gives you the freedom to evolve at your speed, within your budget, and based on your needs. Streamlined cabling reduces the number of cables by up to 90% for more accessible maintenance. Thanks to OpenBlade’s centralized power distribution, this solution even uses up to 50% less power. Servers can be duplicated and supplemented to adapt and meet specific needs. The design of the OpenBlade solution provides full customizable and scalable performance for multiple needs. Each custom node can be managed with its own remote controller integrated in the enclosure. Nodes, switches, and power connectors are easy to reach thanks to a front I/O design. OpenBlade provides high performance and reliability for storage, hosting, broadcast, and HPC.